There’s one fact you need to know if you’re a lover of surf & sand – Oahu is the King of Hawaii’s Sandy Beaches, with 50.3 miles of it, more than any other Hawaiian Island. The State of Hawaii Data Book says so. Now that that’s cleared up, if you’re an Oahu home buyer, this leads to something more. That something is wanting to know what neighborhoods are not only by the beach, but what do those particular sands offer. Beaches are not all the same, just as real estate isn’t, providing something different and often totally unique. 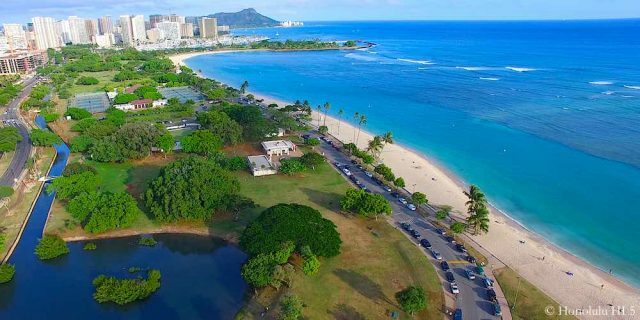 Come with us to take a look at these Oahu neighborhoods, their piece of the Island shoreline and what it means to live there. These 2 districts are well on their way to forming the new urban residential core of the city. Already, the initial properties here have set new standards for Honolulu condo living, with cutting edge amenities, daring architecture and urban design that is fully ‘Hawaii’, yet up-to-the-minute modern. Residents walk through green park spaces to nearby restaurants, nightlife and shopping, with choices to spare. 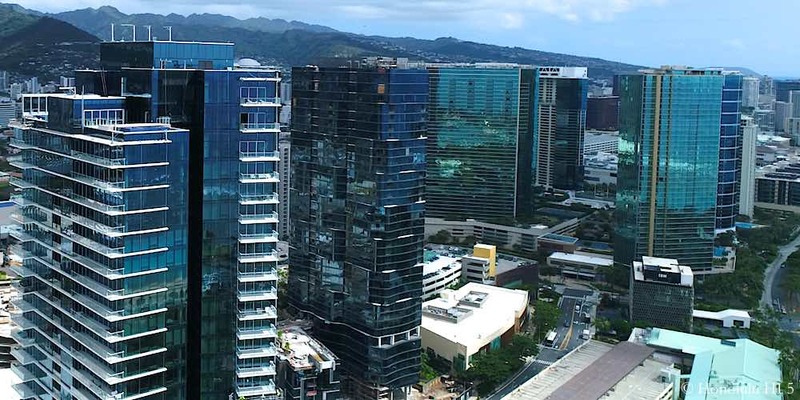 Whether that’s the new Kakaako or the existing, yet ever expanding Ala Moana Center, it’s all central and accessible to the lives of the people here. At home they enjoy panoramic ocean views that are eternal and limitless recreation options within their own communities or at Ala Moana Beach Park across the avenue. Exclusively condos, the price range is a wide one. The typical new(er) Kakaako or Ala Moana market home begins at $500K for a 1BR, ascending to as much as $36M for the ultimate Grand Penthouse that must be seen to be believed. Here, only the sky – and the ocean – is the limit. The coastline in much of this area drops right off into the ocean, leaving just 1 beach. But what a beach it is. Ala Moana Beach Park is unquestionably the biggest bed of sands in Metro Honolulu and a hands down local favorite. With ½ mile of beach there’s room to spare and it’s a deep one as well, providing plentiful space for recreation or just to stretch out. A protective reef keeps the waters calm so waders and swimmers both love it and it’s also the perfect place to learn paddle boarding. With 100 acres across the entire area, you can run a few laps, then cool yourself in these welcoming waters. A full slate of improvements across the board are planned to start this year, including wider walking paths, a new bike path, playground and the beach sands will be fully replaced as well. Most would be hard pressed to imagine this beach park getting better, but this project just might do it. 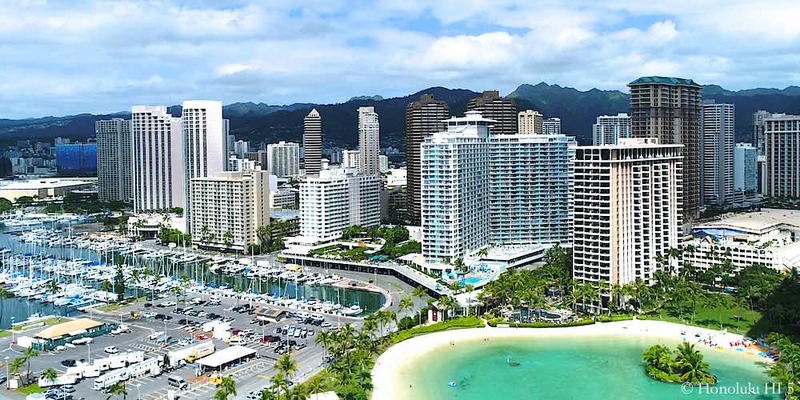 Waikiki has always been a neighborhood as well as a world-famous resort district. While there may be more tourists than residents at any one time on its streets, full-timers benefit greatly from the always booming visitor industry. Shops, entertainment and restaurants populate the palm tree lined boulevards, including some of the most exclusive designer stores and fine dining choices in Hawaii. Though a sizable area, most residents have all of this in walking distance from their doorstep, making it a great place for spontaneous outings. Active types also have massive Kapiolani Park to roam and play in, right under the west profile of Diamond Head. This is the original condo neighborhood, with walk-ups from the 1950s sitting alongside brand new luxury towers like the Ritz-Carlton Residences and Trump Tower Waikiki. A Waikiki condo can be yours for as little as $200K for a small vacation rental studio or you can ascend to the heights with a Grand Penthouse in the Ritz for $15M. 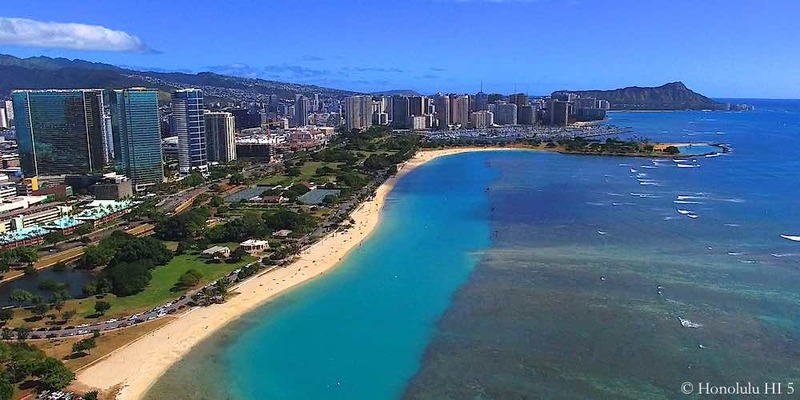 With 1.6 miles of sands, there’s no one ‘Waikiki Beach‘. Instead, it’s best divided up into two main stretches. The first begins in front of the Hilton Hawaiian Village and ending at the Halekulani, a span that includes the biggest beach within this district, called Ft DeRussy Beach Park. The 2nd starts a little further eastward at the Royal Hawaiian Hotel, going all the way to the Waikiki Aquarium. This second section is the more crowded, being in the midst of where most hotels and shopping is located. It also contains the two lagoons where you don’t have to worry about strong currents or large waves. All of the beaches benefit from the protection of reefs, creating safer and more sedate conditions generally for water-lovers. 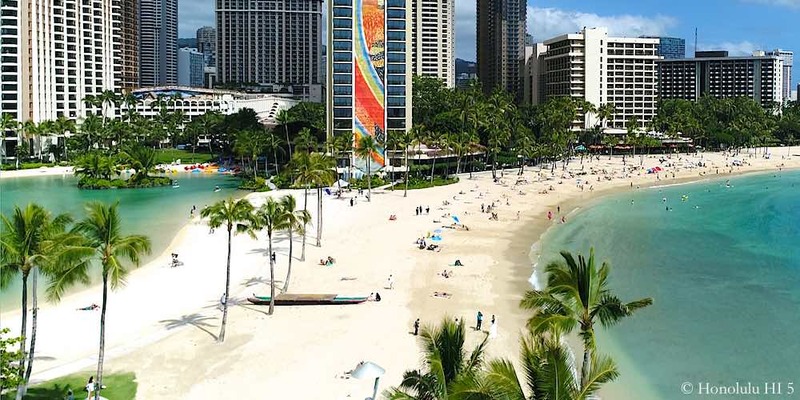 Along with the soft, embracing sand that lines them, you have the ideal combination that has made these shores so famous for their calming, even therapeutic, qualities – and when you live here, they await your arrival every single day you spend in Waikiki. Diamond Head brings to mind immediately images of top priced real estate and breathtaking views. That’s not just a perception, it’s reality. Its boundaries formally start at the Gold Coast, a peaceful collection of vintage houses and the unrepeatable condominiums that hug the ocean closer than building codes will ever allow again. Farther along Diamond Head Road the neighborhood continues, but mostly out of sight on the slope below that ends at the shoreline. This section is purely single family homes, the angled terrain opening up extensive ocean views to almost every residence. These are the larger, more luxurious houses that typify the image of Diamond Head homes, their sumptuousness fitting the gorgeous setting around them. That level of comfort, the wide ocean vistas and the greater privacy the sloping lands afford have especially attracted numerous famous names to buy real estate here. The entry to this community starts with the Gold Coast Condos that go from $500K to $4M, with houses beginning at $2M for a fixer-upper on up to $15M for an oceanfront luxury residence that exists only in the dreams of most mortals. Maybe your dream will come true, though. Diamond Head’s beaches aren’t as well known, but that is definitely an oversight. On the Gold Coast end is Kaimana Beach, with 250 ft of coastline that’s so good it attracts a lot of locals as well as tourists. Open water swimmers, paddle boarders and surfers love Kaimana, a constant line of them heading out from here to take on the ocean swells. Drive down Diamond Head Rd a little, around Diamond Head Lookout, and you’ll see surfers heading down a trail, on their way to the shore beneath. There’s something special down there. It’s ¾ mile of white sands, with some of the best south shore surfing spots off of it. Even if you’re not one to take on the swells, this is a wonderfully removed place to stroll the sands and enjoy the pure pleasure of this tropicala retreat hidden away under Diamond Head. Lastly is Cromwell’s Beach, which sits beside Doris Duke’s Shangri-La and takes its name from her husband. It is not one of the larger options, but it is a firm favorite for many. Swimmers, snorkelers and fisherman all come here to indulge their particular passion. Friendly dogs are allowed so they’re a common sight with their owners, too. Sunbathing is good here as well, if only to take in the wonders of the natural spectacle before you, but be aware that high tide erases much of the sandy areas temporarily. The setting and the scenery on every side has made it one of the most beautiful beaches to take a walk on, whether that’s alone with your thoughts, with a special someone or alongside that loyal four-legged friend. If there’s one place on Oahu that’s associated with expensive, luxury real estate, it’s obviously this one. Its reputation alone draws a lot of interest and the reality does not let it down. The pervasive low-rise environment creates an open atmosphere, aided by the very wide main avenues and the parks and grassy areas that are found throughout the community. Its flatness also contrasts with other nearby areas that have much less even terrain or sit against the mountains. 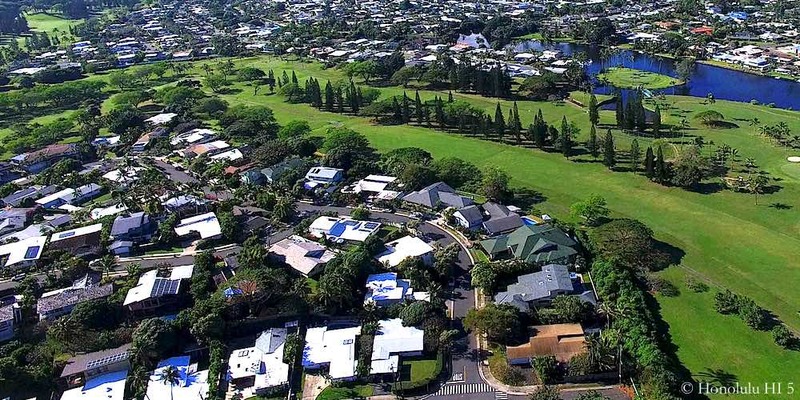 After the closer quarters and busyness of Kaimuki or even the areas a little further down Kalanianaole Hwy, you feel a distinct change as you cross the border into this community. Suddenly, your surroundings bloom outward into roomier, airier vistas all around. It’s like coming out of a tunnel in some ways. 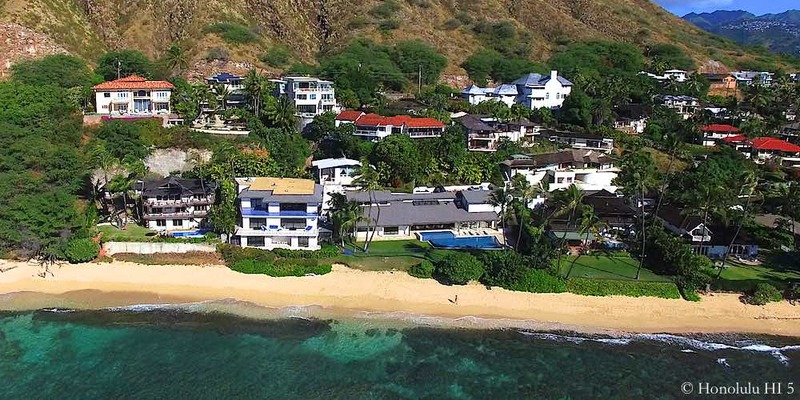 Although world famous for the oceanfront mansions of Kahala Ave and the vintage kamaaina homes, there are also smaller, more modest Kahala homes. 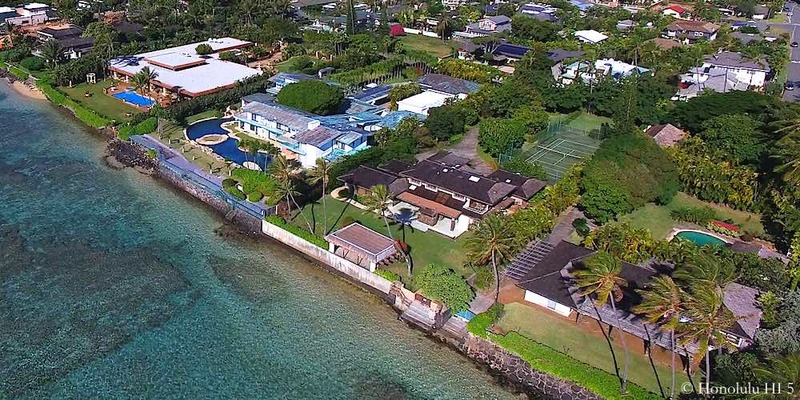 Still, the location will up even those listings, so expect to see an asking price of $1.5M for a fixer-upper, all the way to $20M to hold the title of one of the fabled grand beachfront Kahala mansions. Start saving now. Like the neighborhood, Kahala beaches are a little different. If you’re looking for a place surfing, there’s little reason to come here. Truth be told, some parts of the mile long beach area are a little rocky and they aren’t the widest either. Instead, they fit their environment, offering a more relaxed and contemplative atmosphere. 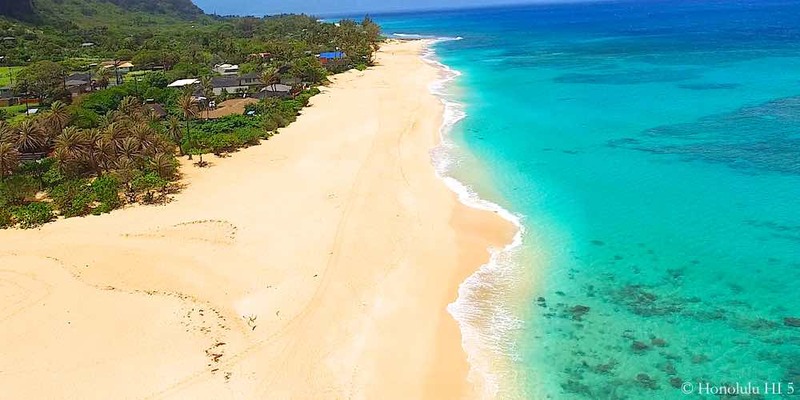 You will find soft sands, however, on Mother’s Beach, entered at the end of Hunakai St. From there it’s a well-loved pastime to stroll eastward by the ocean all the way to as far as the Kahala Hotel. You can enjoy the sights of the Pacific laid out around you as well as the jaw-dropping houses to your left. The beach in front of the Kahala Hotel is especially good for swimming or you can have a day by the water at Waialae Beach Park just before it. One this shoreline it’s all about unwinding at the ocean, not challenging it. When people talk about ‘Keeping the Country Country’, Waimanalo is one of the places they have in mind. Despite the high interest, to put it mildly, of developers, this is one part of Oahu that will probably remain the same sleepy, yet defiantly local style neighborhood it’s always been. The few stores and eateries fit this pattern, being small and locally owned/run, with little interest in serving the tourist trade. These are places residents shop and socialize with each other. There is little that scales past 2 stories so the full green majesty of the mountains that loom almost directly above you on the southern side, then opening up so you can see the breathtaking work of Nature’s touch for what seems miles. 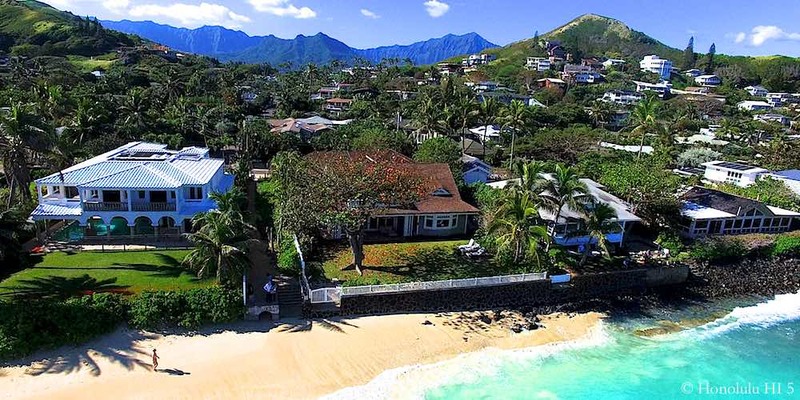 The residences are almost exclusively single family homes, primarily small to mid-size, with the exception of the large gated mansions that line the makai side of Kalanianaole Hwy as you come up to Waimanalo Beach Park. The smaller Waimanalo homes begin at around $600K, going up to $5M or more for the luxury houses on the Sea Life Park side of town. If getting away to a more relaxed pace is your goal for living on Oahu, mark Waimanalo as your next stop. Waimanalo Beach is one of the latest winners of Dr. Beach’s Best Beaches in the US, taking #1 in 2015. Though he focused on the Waimanalo Bay Beach Park area, he could’ve easily included the rest of the 3 mile stretch, because it’s all good. The sands here are soft and the waters a beautiful blue all down this coastline so it’s easy to find a great spot to put down your towel because they’re everywhere. 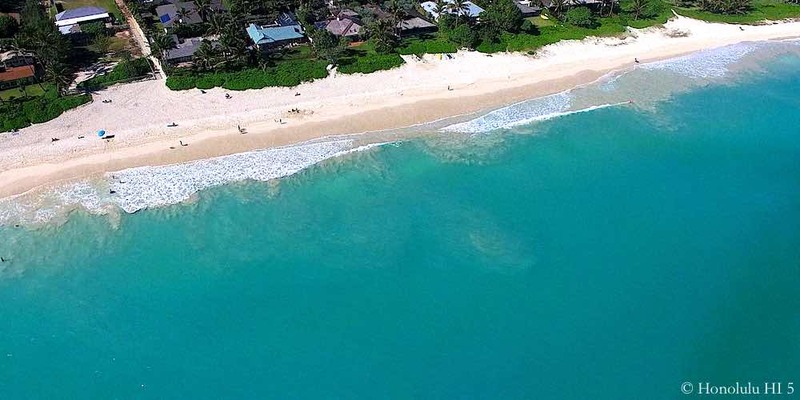 From the south, you have Waimanalo Beach Park, followed by Kaiona Beach Park and finally Bellows Field Beach Park. If you want to make your oceanside experience last, Bellows opens up its camping area in the forest area beside the sands on weekends. Nothing like walking a few feet for a morning wake up dip encircled by staggering beauty that could only exist in Hawaii. The ocean waters all along here are wonderful for wading in and swimming, but the currents are stronger than you’ll find on the south shore. Be cautious and stay near the lifeguards for your safety. 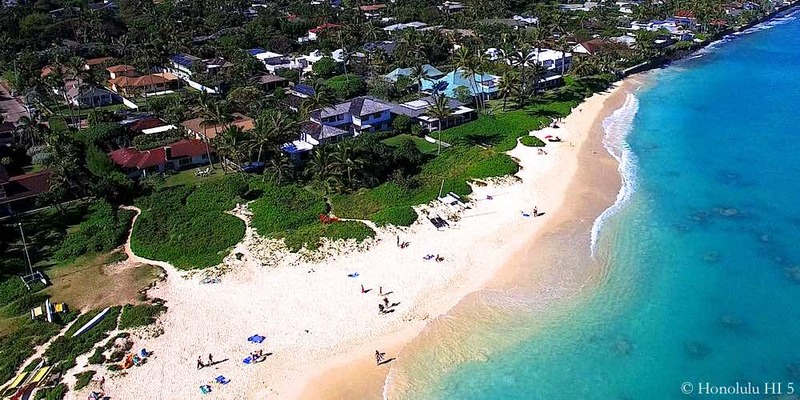 Though locals aren’t happy about Dr. Beach letting the cat out of the bag, it hasn’t changed the fact that this is one of those places you dream about when you imagine living on Oahu. Lanikai is almost certainly Windward Oahu’s preeminent neighborhood. Just around the corner of Kailua Beach Park it is a community all its own. With few sidewalks, people walk in the street, mostly on their way to or from the beach, like a rural resort area. The one way in and out underlines that this is something like a very upscale version of a beach colony, life revolving around the ocean and the quieter side of life. The hillside it sits on allows residents to have ocean views that otherwise would be blocked by neighbors, so they can look out at not only the waves, but the beloved ‘Mokes’ islands just off shore. From the description so far it should be clear that single family homes are almost 100% of the inventory. Most Lanikai homes could be called luxury real estate, with new builds or dramatic renovations, along with vintage beach cottages that perpetuate the history of this place. 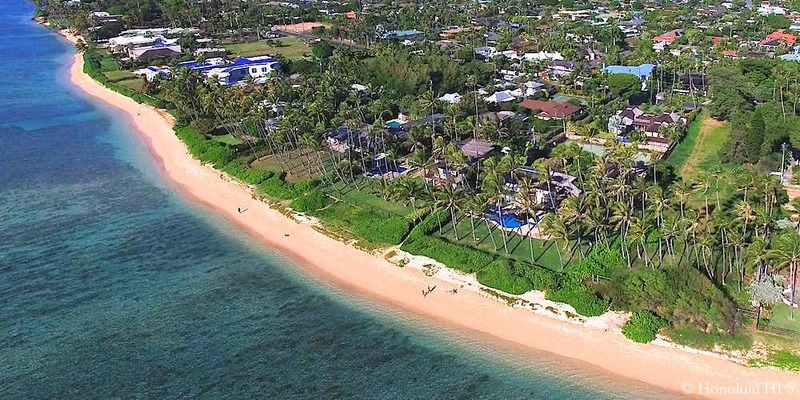 Those bungalows have price tags of at least $1M, but you can spend as much as $12M on the high side for something larger and probably close to the ocean. Lanikai Beach is not one of the most substantial parts of Oahu’s coastline, though you wouldn’t know it from its reputation. Locals flock here at every opportunity, despite the fact that parking limitations make it more and more difficult to get to these days. 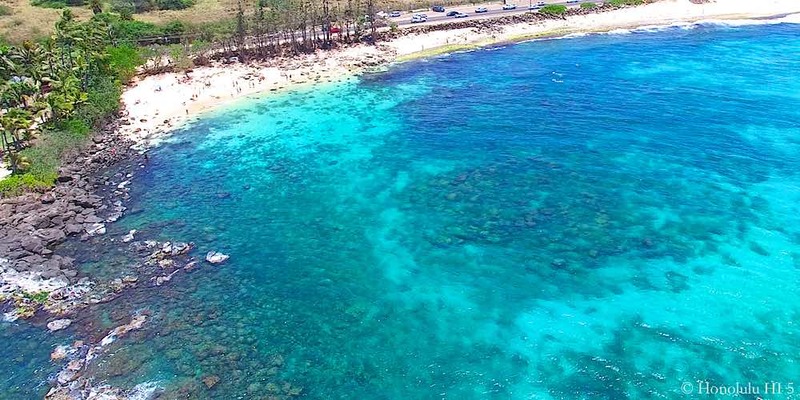 They persists because the 1/3 mile of sands here are said to be some of the softest on Oahu and the waters clearer than almost anywhere else, with possible the exception of Hanauma Bay. The Mokuleas wading not far away bring an exquisite visual touch to an already incredible sensory experience that says you’ve reached South Pacific Paradise. The higher bar to reach these sands, for both outside visitors and interested home buyers, says it all. Lanikai Beach is so good, it feels like something you almost need to earn. Kawailoa and Country Club Knoll are the homes that Kailua Beach Park visitors gaze at and say ‘Must be awesome to live there’. The older of the 2, Kawailoa Kailua, sits right against the park with some against the Mid Pacific Country Club, making it the closest thing you’ll get to living ON Kailua Beach itself. Country Club Knoll is relatively newer, a Mid-20th Century addition that began life as part of Enchanted Lakes, though firmly on this side of the hills. It’s easy to see why they stand out, being across from, or even practically on, the most famous piece of Windward Oahu shoreline. They also remain firmly ‘Kailua’ in feel, being purely residential and comfortably removed from the commercial center of town toward the Pali. The streets within both still have some of their original residences, old kamaaina houses in Kawailoa and Country Club Knolls’ Mid-Century ranch styles. There’s also later, and usually larger, homes as well that sometimes dominate, including 2 townhome communities in Kawailoa. Kailua Beach Park needs little introduction, being a repeat winner of Dr. Beach’s ‘Best Beach in the U.S.’ list that makes headlines each year. More than a good place to lay out, though it’s a superb spot to do so, this is a recreational center. Kayaking is very popular, with even a launching area on the Lanikai side to make it easier to get going. Local parasailors, body boarders and windsurfers head here as well making them a common sight in these waters. You can even swim easily out to Flat Island and enjoy the views from there. The waves coming in are more sedate at Kailua Beach, so it’s a good place to learn a water sport or just take a dip. This ½ mile of sands is something wonderfully special, even for Hawaii – and that’s saying something. As attractive as it is to live by Kailua Beach Park, for some it’s a little too crowded with outsiders these days, traffic often backing up along the park. For those who long for lower volume in both sound and headcount, Beachside calls them. Taking up the makai side of North & South Kalaheo Rd as it heads to Kaneohe MCB, as well as the ocean side of the canal once Kalaheo crosses that waterway, this is where the classic Windward beach life is preserved. That extends to the houses themselves, with vintage Kailua beach homes still found on some lots, smaller in size, but bursting with charm. The pull of a place like this has also seen larger luxury residences come up, as more wealthy buyers have replaced the original owners. Residents all live within a few steps of the beach, if not almost on it, so every lot has beach access that most would die to have. With the tourist trade firmly below their borders, Kailua Beachside residents live in a different world. That world, however, does come with a cost that can range from $1.3 for an As-Is fixer-upper, topping out only around the $20M mark. As they say, though, great sacrifice brings great rewards. The sands of Beachside begin immediately where Kailua Beach Park ends and cover 2.2 miles from there, giving you unending options to sample. This long section of the coastline provides much of the same qualities that have made Kailua Beach Park so famous, just without the vendors and crowds. The sands are deliciously soft and the waves are friendlier, but still fun to ride so bodyboarding, kitesurfing and windsurfing all can be pursued here. Kalama Beach is the best known segment of these 2.2 miles, a little south of the midpoint. That’s primarily because it’s the one beach park in the neighborhood, with picnic tables and some parking so if any area gets visitors, it’s here. Otherwise you can stroll to the sparsely populated sands of Beachside, feel the water wash over your feet and hear the surf speak to your spirit. Any time you want. This may be the eastern endpoint of the North Shore, but it might as well be in the thick of that coastline. From the unmistakably ‘Country, Hawaii style’ surroundings to the magnificent ocean scenery and distinctly less hurried lifestyle, this is North Shore Oahu, no question. This is where the roar of the waves and the crowing of roosters are the characteristic sounds of daily life. Despite that, this community has a shopping center with a Foodland, restaurants and even a move theater. That stands out from most other North Shore communities, balancing the ‘get away from it all’ feel with central conveniences that much of this coast has to travel farther to reach. 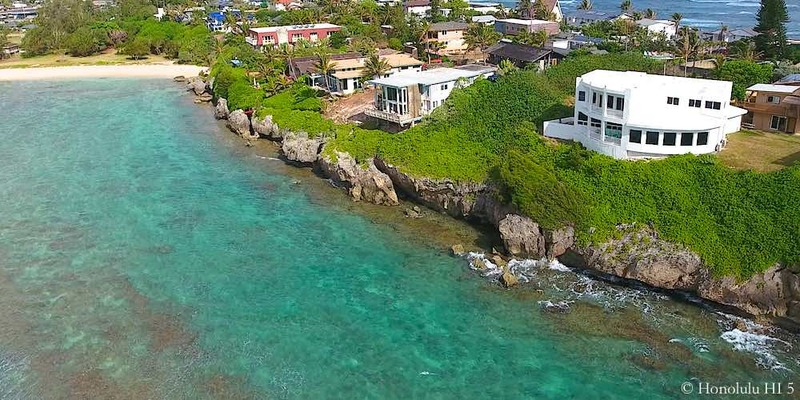 Laie homes are predominantly small to mid-size houses, but recent years have seen luxury mansions raised on oceanfront lots. With residences that different you also have a spread in values, running from $500K to $4M, but all in a beautifully Eden-like environment. 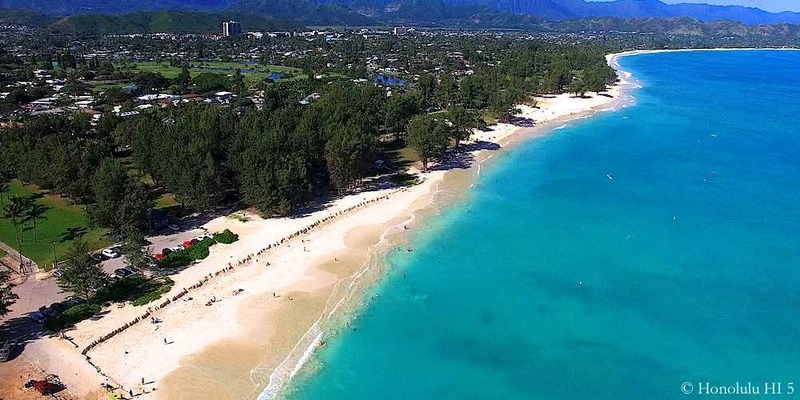 With 2 miles of unspoiled beach, these are places of pride for Laie residents. You can divide it up into two areas, split by the Laie Point peninsula. Below is generally known as Laie Beach, beginning with the park of that name on the south end. The sands between there and the peninsula are welcoming and easy to walk on. Not so thick that your foot sinks, but certainly not hard either. The southern end of the park is known as Pounders for the sound the surf makes hitting the sandbar. It’s also a place surfers love to head out on, but you need to be pretty good. This is still North Shore. The rest of this area is big for bodyboarders and swimming, but only when conditions are friendly. Otherwise, it’s best to head north to a site called Bathtub Beach where the waters are much calmer. Hukilau Beach is the stretch above Laie Point, it’s name making it obvious that the fishing is good here. Swimmers can dive in here as well, but stick to the summer months. The waves call out a lot of surfers here as well, giving what can be very strong swells their best shot. One unique visual treat is Goat Island, a protected bird sanctuary, which lies offshore to the northeast. On this shore, like Laie Beach, laying back on your towel is a pleasure, but the currents may not always be so inviting. Stay safe. Let’s face it. Turtle Bay is not a neighborhood. Instead it’s a retreat resort at practically the northernmost point of Oahu. In other words, it’s as North Shore as you’re ever going to get geographically, removed from anything that resembles development or what you’d call a real town. It’s a luxury oasis, but one that is low-key, allowing the surroundings to work their magic because it’s why you’re there. Even with a full hotel the quiet is sometimes deafening for those not used to it, filled in by the sounds of trees swaying in the trade winds or the rhythmic gurgle of the surf that turns to a soft sizzle as it climbs up the shore. 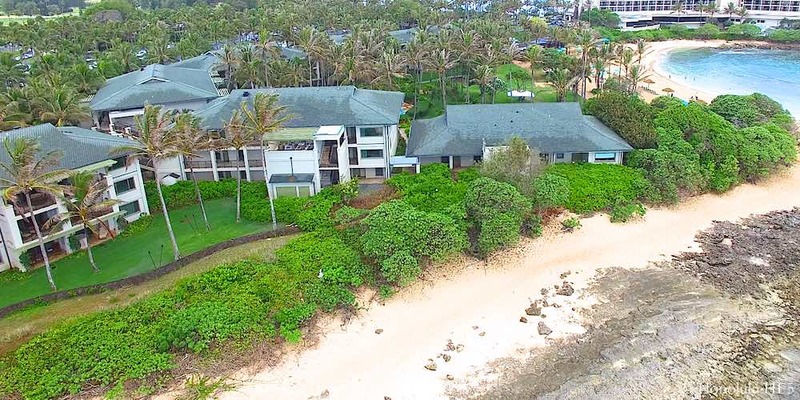 Turtle Bay homes are strictly condos & townhomes, with the more mauka Kuilima Estates starting for $300K and the higher-end beachfront Ocean Villas costing as much as $3M. 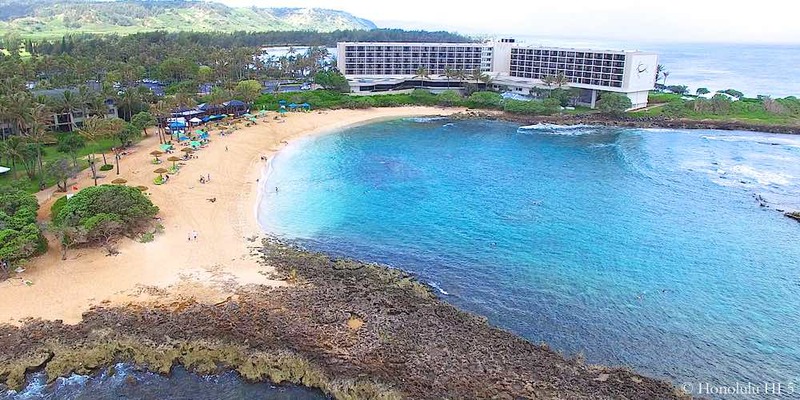 The beach here is variously known as Kuilima Cove, Bayview Beach or just Turtle Bay. Regardless, this is a protected cove, so the notorious strength of the North Shore waters doesn’t penetrate here as much. It makes for a calmer, more welcoming ocean experience, a good reason why there’s a resort located beside it. This beach is well known as a great place for snorkelers, beginners especially. The clearer, more sedate water makes it easy to dive right in and enjoy the unusual number of fish that gather here. Many think of it as the Hanauma Bay of the North Shore. Sun worshippers have plush sands to lay out on on land and the beach is well kept by the hotel. The remoteness also makes it less attractive to the public just because it takes effort, and drive time, to get here. Rarely is this cove truly crowded, even in high season. For those who live here there are no seasons. Just another day to enjoy this diamond of sand and surf. We define Sunset as being between the UH Agricultural Experiment Station on the North and Waimea Bay on the South. That makes for the longest neighborhood on Oahu, comprising 3.6 miles, with beach along almost all of it. This slice of the coast is ground zero for Hawaii’s world famous surf culture, with 2 of the 3 sites of the Triple Crown (Sunset & Pipeline) inside it. It’s the ultimate home for water sport lovers that want to be where the action is. Despite that well known pedigree, this is every bit the North Shore environment, with greenery all around you, the highway being the only way to get around and low-profile residences that keep the horizons clear as far as you can see. Much of the lots are beachfront as well, right on the playground of the sea gods. 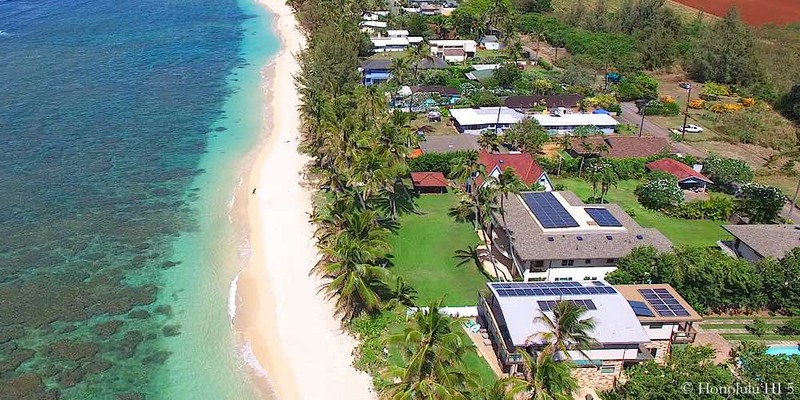 Like other areas nearby, there is the mix of vintage North Shore houses that typify the old plantation and beach bum days of the mid 20th Century, alongside large recent luxury additions, both bringing higher prices due to this singular location. The older residences will be priced at a minimum of $600K, with the newer and bigger Sunset homes on the market for as much as $5M. Living here means you can walk or bike to the surf contests that bring out the best in the business. They come to ride some of the most powerful waves on Earth. That should give you an idea of why these aren’t the best beaches for swimmers, the currents being incredibly dangerous and the swells overwhelmingly strong. Still, there’s nothing else quite like the wave watching you get here, possibly from your own home. Sunset residents have the most miles of white sandy beach on Oahu, so a pleasurable stroll can be extended to a long walk, or run, if the urge strikes. For most, it is the sands where they find the most pleasure, with some wading in being the best bet for your own safety. Most have no complaints, though, when you have such beauty in these beaches and a box seat on the awe-inspiring display of the might of this ocean. Kawailoa North Shore homes are well known, acknowledged for making up the top-drawer neighborhood of Oahu’s North Shore. 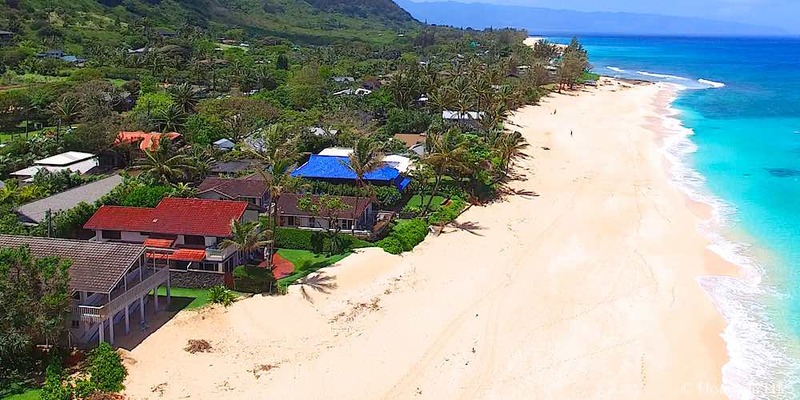 Situated between the local hub of Haleiwa’s shopping & dining and Waimea Bay’s surf and sand, you’re in the midst of this coast’s most active, and most popular, area. 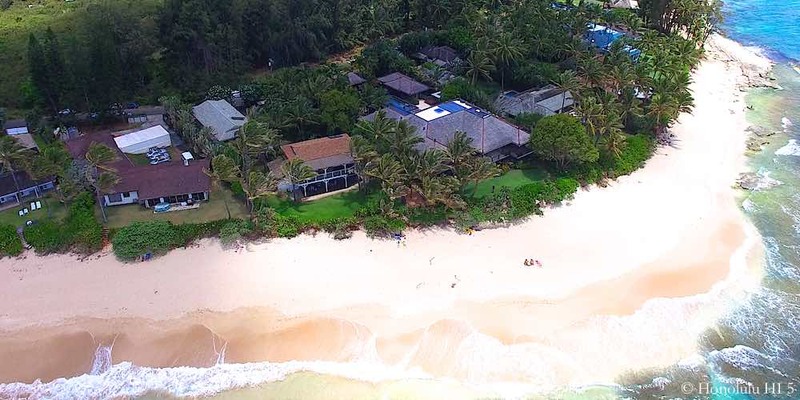 Half of Kawailoa houses are beachfront, a very high number even for Oahu. That means wide open viewing of not just the famed North Shore swells, but some of the most celebrated surf spots in the world. Though it is known for luxury homes, Kawailoa still has some lots occupied by the original Mid-Century houses, including some with 2 or 3 small residences, making up a family compound. Papailoa Rd, a name locals know well, is where you’ll find Kawailoa homes from recent years that have the size and grandeur that have given the community its well-heeled reputation. $800K marks where this market begins, going up to $8M for a front row seat on the towering waves that are difficult to ride, but will easily cast their spell over you from the very first glimpse. 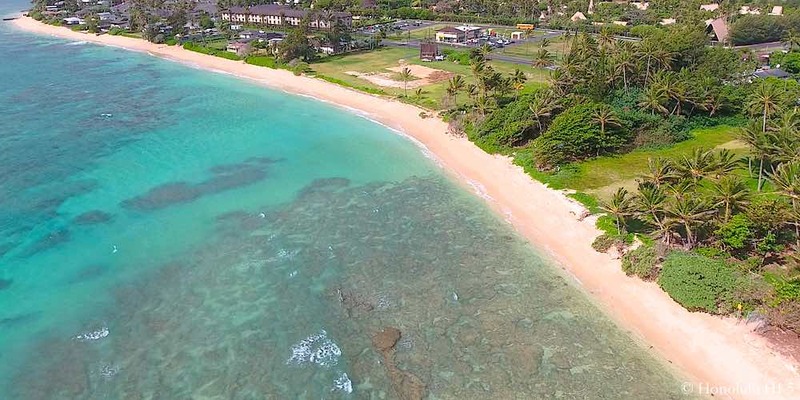 The general area of Kawailoa North Shore includes 2.2 miles of beach, taking in the sands immediately south of the Waimea neighborhood on down to the shore beneath the run of Papailoa Road. The first part of it, below Chun’s Reef, is known as Laniakea Beach, a place that sea turtles are known to frequent a lot. Nature and animal lovers will delight in watching them in their natural surroundings. Much of this stretch is generally good for swimming close in, since the waters are calmer than most near to the shore on this coastline. The surf, though, should be left to those with the special skills needed to face the challenge. Despite that limitation, the sands are wide in most places and make for wonderful relaxation and quiet communion with the Pacific and the life within it. For the vast majority, this is not a water sports area. So, although that may keep you out of the waters most of the time, it brings sights that only the might of Mother Nature could put on for you – and that is what will keep you in Kawailoa. Waialua and Mokuleia are the forgotten parts of North Shore Oahu. They sit on the extreme western end of the coast, with no legendary surf spots or quaint shopping stops. That’s precisely the point people live here, because it means the tourists stay away and they can get on with the quiet life. Both are small communities. Waialua’s roots, for instance, are from the now gone sugar plantation, but numerous families of the workers remain, held by the bonds of this neighborhood that still hold strong. Mokuleia homes, in general, are more expensive than Waialua’s, the highlight being those on Crozier Road, which lines the ocean. It is one of the premier residential streets on the North Shore. Yet, you’ll also find agricultural lots here, something that has been especially encouraged in recent years. 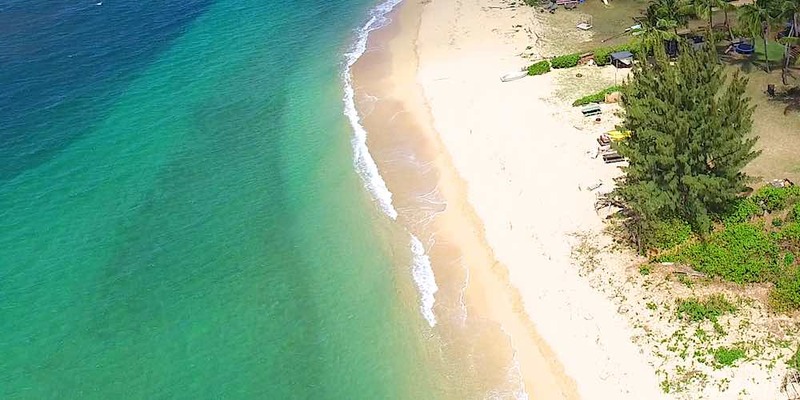 Not everyone lives on beachfront property in either place, but you can count on being able to walk, bike or drive briefly to get to the shoreline if your residence is in Waialua or Mokuleia. 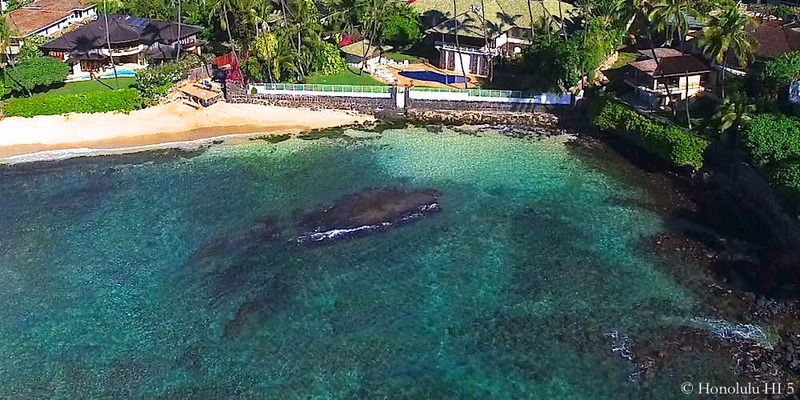 There is a wide price range as Wailaua is the most affordable neighborhood on the North Shore, yet you also have the luxury houses of Mokuleia’s Crozier Drive. So, the floor can be set at $400K, rising to a ceiling of $5M. Almost 3 miles of beach line this westernmost duo of the North Shore, most of it off the radar of visitors and even outside locals. There is one small exception. That being Mokuleia Beach Park, the one area where there are bathroom facilities and camp sites. It’s also good surfing, not as dangerous as up the coast, but still to be avoided by most in the winter, though. There is a reef area which makes for calmer conditions for swimming and snorkeling, plus fishing of all kinds, including spearfishing. Further out you’ll often see kite and windsurfers who come whenever possible. On this beach, as well as all the way down the shore, shell collectors will want to come whenever possible in the winter to see what the big waves have left for them to find. It’s shell heaven during those months. Wailua and Mokuleia’s waters are also known for being crystal clear, the way the ocean should be. It was like that everywhere on Oahu once. Fortunately it still is on these beaches. 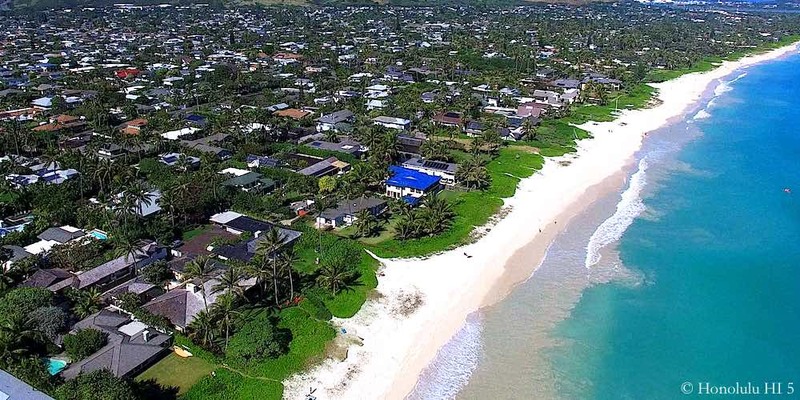 The fact that Oahu real estate values rise as they get nearer to the sands is a powerful tell. It shows the pull of the ocean in us, a demand that cannot be quieted. It should also be evident from this survey alone that there is a richness in the experience of the beaches across our Island. The more sedate Lanikai Beach gives way to the active waters of Kailua Beach Park right next door. They both, in turn, are very different to the wonderful sands of Sunset where the wave watching is, for the vast majority, similar to a ringside seat for an incredible stadium spectacle. It’s not about better or worse, it’s about living in a home by the beach and the waters that fit you and your lifestyle. Oahu, as you should know now, has it covered, wherever you are on the spectrum. Just one question. Which beach fits you?